I politely picked a mirror for client and said that I picked the one with the least detail for all of the above reasons. BUT also said something along the lines of “If you really want to know what I would do if it were my space, I would paint the mirror a dark blue to match your other accent pieces. No black. No gold. No white. 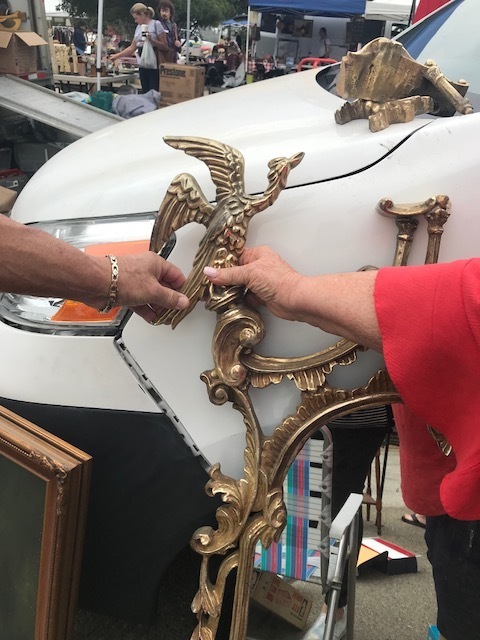 Less predictable.” And I kid you not I was so surprised when she said “Let’s do it.” (Insert shocked super excited emoji here) Well I wasn’t about to let her refinish a $400 mirror so let the flea marketing begin! So we set an appointment to scope out the local flea market in two weeks. You may or may not know that going to a flea market looking for something specific is a COMPLETE gamble. Especially one as small as the one we were going to in both of our neighborhoods. I went to the market about 30 minutes before she came just to scope out what they had and start haggling before. And I was surprised to find two runner ups. But one had my attention. It was a lot more intricate and…well here is a picture of it…. I mean…..HELLOOOOOO SEXAY THANG. Am I right? I had my navy blue filter glasses on and it was a prime suspect of perfection. I saw it! I immediately attempted to show client but of course I couldn't find it at first so we stumbled upon a couple more. But we found it. She was a little hesitant. The birds were not her thing and the pagoda on the top was not giving it the right scale. So we popped them off! Several coats of paint later and some sawing, sanding and filling, we have an ecstatic client with a one of kind piece of jewelry for her home. See pictures below to see transformation. Stay tuned for final project pictures of the table accessorized and the room finalized!